Yoga Nidra (Body Scan). Body scan can be done at any time of day and in any position where the body isn’t working to maintain a position. We find it works best by lying down on your back in a place free of distraction. 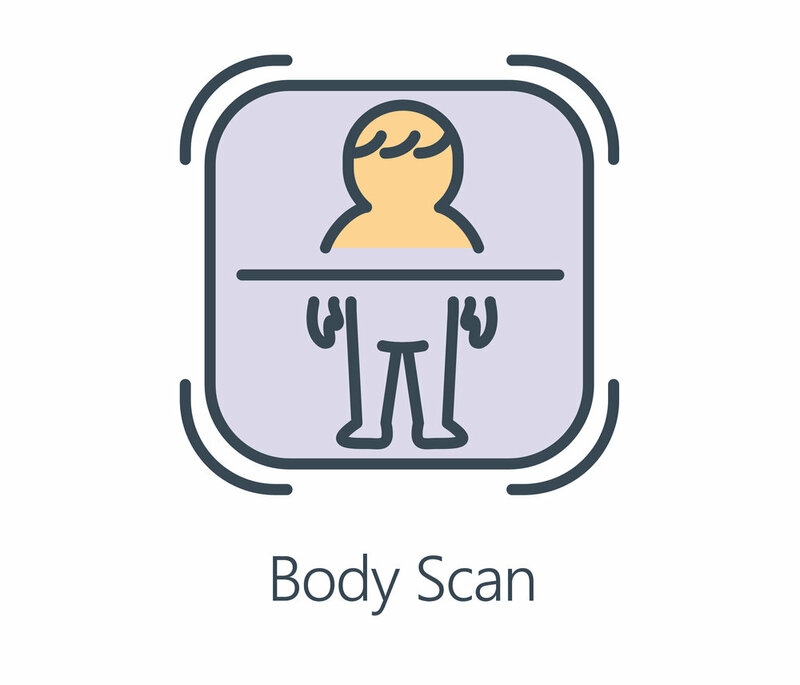 A body scan can take anywhere from ten to forty minutes – it’s entirely up to you. There are many free resources on the internet you can choose to guide you and we list some in Mindfully Mobile. Or, you can guide yourself. The body scan is a moving, sequential focus on specific body parts. As you do it, you will breathe naturally and remain as still as possible. The intention of a body scan is not to put you to sleep during the practice. Remaining attentive and awake is key. Be prepared to lie still for the entire time on the floor or bed. Lie down on your back with legs comfortably apart and feet falling naturally open. Extend your arms at your sides so that your armpits are open and drop your shoulders. Have your hands comfortably open with palms facing up. Check your alignment so that your legs and spine are aligned. Your head should be aligned and your chin about one-hand-width from your chest. Check your body again and make any adjustments that are comfortable. Try to remain in this position for the entire body scan. Close your eyes. Focus your attention on your breath. Take one full, deep breath, briefly hold, and exhale. For several normal breaths, observe where you sense your breath, typically at the tip of your nose as the air passes or as your belly rises and falls. Breath normally. Become aware of what you hear around you. Be aware of any sounds you hear without paying close attention to them. Become aware of sounds most distant from you and shift your awareness to sounds closer to you. Shift your awareness to sounds and sensations within your body, specifically breathing but any sensations that come to your attention. Focus your attention on your right heel. Notice the sensations of contact with the surface. Take a moment to concentrate on what you can sense in the skin, in the bone and in the tissues. Become familiar with your right heel. From your right heel, shift your attention to the bottom of the right foot. Imagine you are painting the bottom of your foot with a small brush and paint the entire surface as well as the inside of the bottom of your foot. In sequence, advance your attention to each part of the foot. Advance to the big toe, each toe, the spaces between the toes, and the tops of the toes, then to the top of the foot. Continue to advance your attention to the lower leg, knee, upper leg, groin and hip, taking time to explore all the muscles and tissues. Notice any areas of tension or soreness as you advance your scan and linger in those places. Where you can, breath into any areas of tension and release the tension. Before advancing further, notice how the entire leg feels. Notice any lingering tension and breathe to release it. Continue to advance your attention from the right hip across the pelvis to the left hip. From the left hip shift to the left heel and advance up the left leg as you did the right. From the left side, advance your attention to the torso starting with the buttocks and lower back. Advance your attention to the abdomen, middle back, chest and upper back, repeating the practice of noticing sensations and releasing tension. From the upper back, advance your attention into the right shoulder and armpit. Advance down the arm slowly reaching each major muscle group and each joint including each individual finger. After the final finger of the right hand, notice the entire right arm from shoulder to thumb and pinky finger. Release any lingering tension. Advance across the collarbones and upper back to the left arm. Advance as you did on the right side, returning to the neck. Advance your attention up the neck to the head. Advance slowly to include the muscles and tissues including the base of skull, the jaw, tongue, cheeks, nose, ears, eyes and scalp. Once complete, scan the entire body for any lingering sensation of tension. Let your mind focus attention on each body part for several seconds up to a minute. The more time you take and the deeper you focus, the greater the benefit. The body scan is a moving, sequential focus on specific body parts. Breathe naturally and remain as still as possible. Remaining attentive and awake is key. Remove your shoes if you can. Be aware of any sounds you hear without paying close attention to them. Become aware of sounds most distant from you and shift your awareness to sounds closer to you. Shift your awareness to sounds and sensations within your body, specifically breathing but any sensations that come to your attention. 1. Inhale fully, then exhale slowly. Bring your attention into your body. 2. Close your eyes if that works for you. 3. Notice your entire body as it sits in the chair. Feel the weight of your body on the chair, on the floor. 4. Breathe through your nose - inhale deeply, slowly, then exhale completely and more slowly. 5. Notice your feet on the floor, notice the sensations of your feet touching the floor. The weight and pressure, any vibration, the temperature. 6. Notice your legs and seat bones against the chair - pressure, pulsing, heaviness, or lightness. 7. Notice your back against the chair. Feel the support of the chair. 8. Bring your attention into your stomach area. If your stomach is tense or tight, let it soften. Practice a 3 Part Breath to expand and relax your stomach area. 9. Notice your hands. Are your hands tense or tight. Without moving them see if you can allow them to soften. 10. Notice your arms. Notice any tension in your arms. Allow your arms and shoulders to be soft. 11. Notice your neck and throat. Let them be soft. Swallow once. 12. Soften your jaw. Let your face and facial muscles be soft. Notice your ears and scalp. 13. Then notice your whole body from head to toes. Scan for any tension – and allow it to release. 14. Be aware of your whole body. Take 3 Part Breath. Sometimes we have trouble falling asleep, wake in the night, or simply feel the tension in the body. We have a simple scanning and breathing practice that helps us release the tension in about five minutes. Breathing is essential in the practice. Do not hold your breath at any point as that only increases tension and can trigger a stress response. Releasing tension is our intention. When focusing on a body part as instructed, try to relax the rest of the body, particularly your torso, neck, face and head. Hold each step for about five to ten seconds. You will find that increased practice allows lower hold times. You can work with both sides of your body at the same time or one side at a time. 1. Begin with your feet. Inhale. Begin exhaling as you curl your toes in as tightly as possible for about five second, then release. Feel the tension lesson as you let go. Slowly exhale completely. Relax and breathe. 2. Inhale. Begin exhaling as you flex your feet up as far as possible, spreading your toes, opening the sole and lengthening the Achilles heel. Hold and release. Relax and breathe. 3. Inhale. Begin exhaling as you tighten the lower leg muscles including around the shin. Hold and release. Relax and breathe. 4. Inhale. Begin exhaling as you tighten around your knees, noticing the connecting tissues to the upper and lower legs. Hold and release. Relax and breathe. 5. Repeat for the upper leg muscles, hamstrings and quadriceps. Notice the connections to the groin and buttocks. Remember to inhale and exhale as before! 6. Repeat for each of the buttocks, abdomen, middle back, including latissimus dorsi, chest, shoulders, upper arms, lower arms. Notice connections. Remember to breathe. 7. For hands. Inhale. Begin exhaling as you clench the hands into fists. Hold and release. Relax and breathe. Gently flex your hands in and out. 8. Advance your attention to your neck with an inhale. Begin exhaling as you tighten the muscles and tendons in your neck. Hold and release. Relax and breathe. 9. Advance your attention your head. Repeat the process for your jaw, facial muscles, ears and scalp. Notice connections. Remember to breathe. 10. Scan your entire body for any residual tension or stress. If you find it, breathe in and send your attention to the space and let the tension go as you slowly exhale. Gently move any part that wants to move. Breathe.